Continuing with the bottom half of Bracket Five of the Battle of the Books, we have The Devil's Nebula by Eric Brown going up against Deadfall Hotel by Steve Rasnic Tem. The winner will be the book I (Aaron) most want to continue reading after 25 pages. The Devil's Nebula: Abaddon paperback, June 2012, 350 pages, cover art by Adam Tredowski. 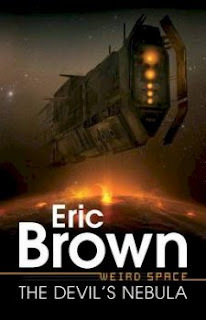 Eric Brown is the author of over two dozen science fiction books and is a two-time winner of the British Science Fiction Award. The Devil's Nebula is the first volume in the Weird Space series. Brown has a second book in this series forthcoming, Satan's Reach, and further volumes are likely. Abaddon Books specializes in ongoing shared universe series, mostly fantasy and steampunk and zombies, but this new series is all space opera. The Devil's Nebula takes place in a far-future universe, in which humans have battled an alien race called the Vetch. Ed Carew is the captain of the ship The Paradoxical Poet. His three-person crew has been dispatched to Hesperides, a former human colony evacuated when the Vetch captured this area of space. Their ostensible mission is to recover a rare piece of art inadvetently left behind, but a secondary objective is to find the wreckage of a mysterious spaceship that crashed on this world. When they arrive on Hesperides, Carew finds a Vetch ship has arrived ahead of them, looking for the same wreckage. 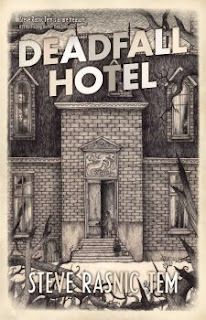 Deadfall Hotel: Solaris trade paperback, April 2012, 301 pages, cover art by John Kenn Mortensen. By my count, Steve Rasnic Tem is the author of eleven books, seven solo and four in collaboration with his wife Melanie, and a half-dozen chapbooks. His work emphasizes horror, but also includes a fair amount of fantasy and science fiction. He has won a World Fantasy Award, two Bram Stoker Awards, and two International Horror Guild Awards, among other honors. The protagonist of Deadfall Hotel is Richard Carter, whose wife recently died when their house burned down. Richard was able to save their daughter Serena, and now he struggles to care for her while dealing with his own grief. A strange man named Jacob Ascher offers Richard the chance to succeed him as the manager of the Deadfall Hotel. The first 25 pages end with Richard and Serena arriving at the secluded hotel, which readers suspect is filled with supernatural presences. The Battle: We have here two top-notch authors working at the top of their form, and now I'm supposed to try to justify putting down one of their books after only 25 pages. Through 25 pages, The Devil's Nebula is engaging, fast-paced space opera. We have already had our first encounter with the bad-guy aliens, which ended in an interesting hint that maybe they aren't so bad after all, and maybe there's a greater threat lurking out there in the universe. At the same time, Brown has done a nice job of introducing the dynamic between his three human characters. I particularly like how Jed is the brash member of the crew, but when they get into a scrap, it's pint-sized Lania who suddenly steps forward to take charge. "Daddy?" came Serena's sleepy voice out of the back seat. "We're in the mountains already? Why didn't you wake me up?" "They're not as close as they look, honey." But he wasn't really positive about that. . . .
"When I was little, I used to think all my good dreams floated up into the mountains," Serena said softly. "But the bad dreams, the nightmares, they floated down from the mountains, and through the city streets until they found the bedroom they were looking for. Isn't that funny, Daddy?" On a sentence-by-sentence level, Deadfall Hotel is exquisitely written. Not that much happens in the first 25 pages, but the quality of writing by itself would be enough to get it past many first-round opponents. But unfortunatey for Tem, The Devil's Nebula is also very nicely written, and Brown has advanced the plot far enough in the opening section to get me engaged in the story. While both books are well done, that makes The Devil's Nebula a bit more difficult for me to put down. The Devil's Nebula moves into to the second round, where it will face Nightglass by Liane Merciel.